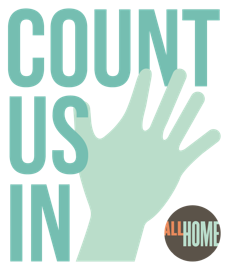 The 2018 Count Us In (formerly One Night Count) report found 12,112 people experiencing homelessness across the region on January 26, 2018, including 5,792 people sheltered in emergency shelters, safe havens and transitional housing and 6,320 people on the streets, in vehicles or staying in tents or encampments (both sanctioned and unsanctioned). The count includes a 15 percent increase in unsheltered people and a four percent increase overall, the smallest increases in homelessness in the region in the past four years. The biggest improvement was a 31 percent reduction in veteran homelessness, the result of increased investments and strong collaboration across federal, state, county and local governments and local non-profit agencies. This coordination includes weekly conferencing among the partners utilizing a by-name list to connect each veteran to appropriate services and housing to achieve and maintain stability. Local housing authorities and local landlords are also partners in this effort. Similar collaboration, including support from local business and philanthropy and successful prevention and diversion programs helped to reduce homelessness among minors (under age 18) by 22 percent and family homelessness by 7 percent. The report showed several changes among the unsheltered population, including a 14 percent reduction in people staying in tents and a 46 percent increase in people sleeping in vehicles. The largest increases in homelessness were among single adults. Nearly all individuals experiencing homelessness – 98 percent – said they would immediately move to housing if it were available, underscoring the urgent need to address the lack of affordable housing countywide. “In just four years, we more than doubled the number of people who moved from tents, shelters, and vehicles into stable housing, yet the pace of people falling into homelessness continues to overload our services and resources,” said King County Executive Dow Constantine. "We must continue to take urgent action on the homelessness crisis with holistic, regional solutions. The reduction in veterans who are experiencing homelessness shows we can have an impact with focused strategies. But there is much work to be done, especially to address the root causes of homelessness," said Seattle Mayor Jenny Durkan. Veteran homelessness declined by 31%, including a decrease in chronic homelessness among veterans of 23%, thanks to collaboration and additional resources. Youth/young adult homelessness remained largely the same (1% increase), unaccompanied minors experiencing homelessness was reduced 22%, and family homelessness decreased by 7% - largely due to dedicated efforts by philanthropy and local service providers and new funding from Best Starts for Kids. Unsheltered homelessness increased by 15%, including a 46% increase in vehicle residency. The highest increases were among single adults and chronic homelessness (which rose by 28%). Homelessness disproportionately impacts people of color. The majority of the local homeless population surveyed identified as people of color. People experiencing homelessness in King County are our neighbors: 94% are from Washington State and of those, 83 percent reported living in King County at the time they became homeless. Only 6 percent reported a last address out of state. Of the unsheltered population, 71% was in Seattle; 15% was in SW King County. History of domestic violence or partner abuse remains prevalent; more than a third(36%) said they had experienced abuse. About 70% reported living with at least one health condition and over half reported a disabling condition. Most mentioned were mental illness, substance use disorder, and Post Traumatic Stress Disorder. Lack of housing affordability (21%) and loss of job (25%) were the most reported causes of homelessness.